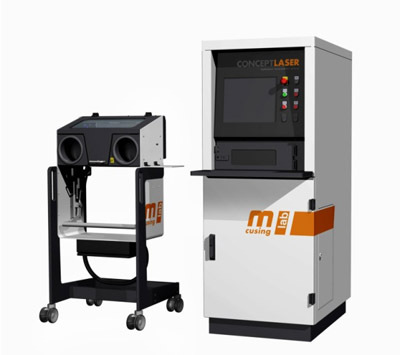 Concept Laser’s Mlab cusing has already firmly established itself as a successful additive manufacturing platform, for the production of parts in a wide range of materials including Cobalt Chrome, Stainless Steel, and precious metals such as Gold and Silver. The latest version of the system, Mlab cusing R, now offers the capability to produce components in Titanium. The introduction of the Mlab cusing system in 2011 opened up a series of new application areas for metal additive manufacturing, especially within the dental, medical and jewellery market sectors. This enhanced capability, to produce components in a range of titanium alloys, will further expand the opportunities for additive manufacturing of intricate medical and dental parts. Extremely compact, measuring just 705 x 1833 x 1220 mm (WxHxD) and lightweight at just 500kg, the Mlab cusing R is ideally suited to either a production or laboratory environment. A special feature of all Mlab cusing variants is the user-friendly, pull-out drawer system. This includes both the construction and dosing chambers and the powder storage container. To accommodate the reactive nature of Titanium and Titanium alloys, the Mlab cusing R has been designed to meet the stringent ATEX directives for processing such materials in a safe manner. The operating principle for the new Mlab cusing R is both practical and straightforward. A glove-box module is docked onto the front of the machine to allow loading and unloading. The build module can simply be pulled out into the glove-box, thanks to the machine’s original pull out drawer concept. With the build module in position, the glove-box is then purged with argon making the chamber inert, an essential pre-requisite for safe processing of Titanium. The operator accesses the build chamber through the glove-box carrying out the loading process or removing finished components. After the end of this process, the build module is returned to the machine and the glove-box can then be removed. The drawer system is available with three different build envelope versions: 50 x 50, 70 x 70 and 90 x 90 mm. The height of the build envelope is always 80 mm. At the heart of the Mlab cusing R is robust and powerful 100 W fibre laser with a focus diameter of less than 25 µm. This provides the capability to produce excellent surface finishes and intricate component structures, essential characteristics for the production of medical and dental components. The full range of Concept Laser LaserCUSING® systems are available from ES Technology Limited, who are responsible for the marketing, sales, servicing and support of Concept Laser products throughout the United Kingdom and the Republic of Ireland.